Scotland lock Jonny Gray is set to return to action for Glasgow when the Pro12 champions step up their bid for a play-off spot against Ulster on Friday. 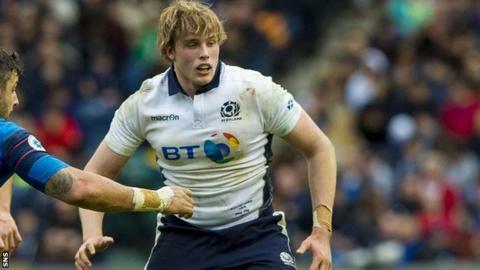 Gray tore a chest muscle in Scotland's Six Nations win over France, ruling him out of their final match in Ireland. But along with fly-half Finn Russell, who also missed the Dublin match after concussion, Gray has been declared fit. "It's great having Jonny back for the run-in," said Warriors forwards coach Dan McFarland. "While the international players have been away, the guys who have been here have excelled. But Jonny is an excellent player, in my mind a world-class player already at a young age." Glasgow, sixth in the table, have won four games in a row since losing 13-10 at Ulster in early February and are now four points behind the Northern Irish province in fourth, with a game in hand. With Gray, Russell and the rest of their Scotland contingent - Glasgow had 11 players on duty in Dublin - returning to the fray, lock Rob Harley admits there has been a step up in intensity at training. "You know when the players around you are of a very high quality, you have to lift your level and perform everything to a very high standard," he told BBC Scotland. "It is challenging but fun as well to be training at that level."